Amber has her dream job, in London, she works hard, is on call it seems all the time and is in demand. However, she does not have that ever talked about work/life balance. She has not had a holiday for more than 3 years and positively cringes if anyone messes up her near perfect kitchen, by actually cooking in it. When her boyfriend, Jake decides he is going to go back to help his Auntie Annie at her farm so that it can still remain in the family, Amber has to decide if she can possibly cope without him in her life, let alone whether she can cope living so far away from the city and all its delights. When a job opportunity raises it head, Amber has a difficult decision to make, but her boss gives her six months to think about it, which means she gets six months to see whether farm life is for her…..but she doesn’t tell Jake any of this. Amber embraces farm and country life fairly quickly, even if it is very much removed the country lifestyle magazines she has been used to reading. She gets on Annie and suddenly finds herself welcomed into this thriving community. However, it was never going to be an easy transition, from incidents with kettles, emergency midwifery, the threat of cancelling the village fair, a wedding and even attempting to bake a cake in a kitchen far removed from the sterile environment in London that she was used to. Amber seems to take all of these challenges level headedly and uses the skills from her city job with as much aplomb in the country. The one challenge she did not expect though is Jake’s ex girlfriend. Returned from wherever she went and suddenly wanting to be everyone’s friend in the village. It seems that Amber cannot manage this situation without her emotions getting in the way. The six months are nearly up and perhaps it is time to tell the truth before someone else beats Amber to it? A really lovely read that had me in the mind of authors such as Trisha Ashley, Carole Matthews. A book with a sense of community, the coming together of everyone to fight a particular cause and the threat of the equilibrium being disturbed by a returning figure. A delightful summer read and one that makes you want to secretly don your own flower wellies and get stuck right in. 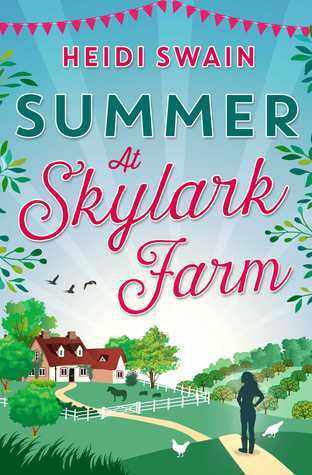 Summer at Skylark Farm is out now.